Audi recently launched an ad campaign for the 2011 Super Bowl that features a Twitter hashtag as part of the advertisement. This is the first time that any advertiser has used such a tactic in their television spots. A driving reason for this is to help fray the cost of an ad in the Super Bowl. $3 Million per :30 spot, or $100k per second, is a big investment, so incorporating social media elements helps Audi to extend their brand exposure and get more added value. Audi began teasing the campaign about a week prior to the Super Bowl with short vignettes on You Tube. These teasers introduced audiences to the characters, themes and overall feel of the ads. Audi is looking to attract a younger, more innovative, luxury car buyer. 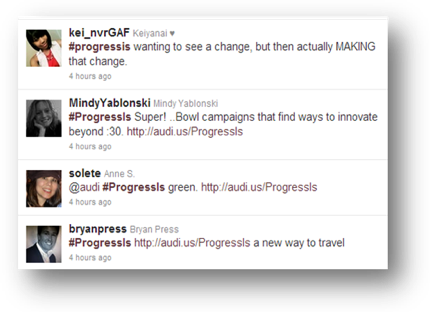 The main :30 commercial was featured during the Super Bowl and the hashtag, #ProgressIs, was visible in the last frame. The hashtag was used as a 3-day contest on Twitter for people to tweet their definition of progress. Audi will choose the Top 10 and those winners will be eligible for and R8, and other “old world luxury” prizes. There is also an opportunity to win $25,000 for charity. The Audi Facebook site also features components from the campaign where viewers can play a game called the Estate Sale. This 5-day campaign engages users by having them watch the :30 ad online and identify objects they see in the ad. The more items you find, and the more often you play, the better the prizes you’ll be awarded. While the #ProgressIs hashtag did not show up on the Twitter trend list, Audi did see a huge spike in followers. The increase started at the same time as the You Tube teaser campaigns, which shows that audiences were excited and engaged with the campaign. Overall, Twitter followers increased 47% and Facebook followers actively discussed the campaign on their page. Will this help sell more cars? Time will tell. But it certainly extended the life of commercial spot.